Is Everyone In Your Family Enjoying Quality Dental Care? As your children grow up, you are responsible for helping them understand the world in so many ways. When it comes to smile care, you can start by cleaning their teeth for them, but eventually, the task falls to them. Fortunately, when it comes to lessons on oral health matters, you can have help from your dentist. 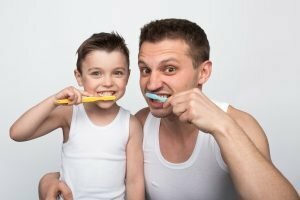 Your McKinney, TX dentist can work with kids on recognizing the right approach to protecting their teeth, and practicing good habits. As worried as you might be about your little one’s smile, don’t forget to make sure your is also healthy! Our practice can also help you manage your oral health needs through routine dental visits. Once your child’s first tooth shows up, you can bring them for an introductory appointment with their dentist. By the time they turn three, they should start seeing their dentist for the kind of recurring care used to support patients of all ages. In addition to this, kids are also supplied instructions and guidance that can make their daily smile responsibilities clearer, and easier to follow. Setting the right example for your kids can help your lessons carry more weight. If you want your kids to believe you when you say their oral health matters, make sure you are taking care of your teeth as well. Regular dental visits for you can help you lower your risk for cavities, and keep you well defended against gum disease and tooth decay. Between dental exams, you can make choices that benefit your smile, and your kids’ smiles. Think about what is being served at the dinner table, and what everyone brings with them to lunch. Cut back on sugar as much as you can. Taking the time to brush and floss with your kids also helps, particularly if they are new to being responsible for these tasks themselves. Help them identify proper motions when they brush and floss, and make sure they are clear on the idea that consistency is key if they want to protect their enamel from decay. Illume Dental is ready to help families in and around the McKinney, TX area. For kids, our practice can provide guidance and instructions in addition to the general dental care provided to all patients. Everyone who makes an appointment can enjoy access to modern care in a welcoming environment. With the right approach at home, and regular dental visits, your family can keep their teeth safe from cavities and gum disease. To plan your consultation with Dr. Chen, call Illume Dental in McKinney, TX, today at (469) 301-1255.